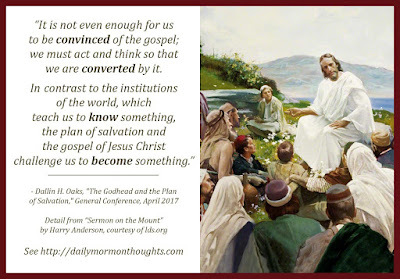 "So, how does understanding this heavenly revealed doctrine about the Godhead and the plan of salvation help us with our challenges today? "Because we have the truth about the Godhead and our relationship to Them, the purpose of life, and the nature of our eternal destiny, we have the ultimate road map and assurance for our journey through mortality. We know whom we worship and why we worship. 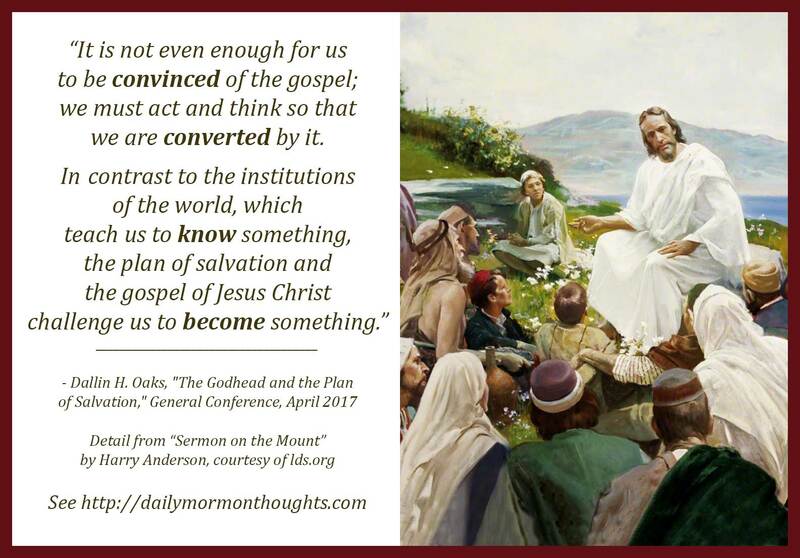 We know who we are and what we can become (see D&C 93:19). We know who makes it all possible, and we know what we must do to enjoy the ultimate blessings that come through God’s plan of salvation. How do we know all of this? We know by the revelations of God to His prophets and to each of us individually. "Attaining what the Apostle Paul described as 'the measure of the stature of the fulness of Christ' (Ephesians 4:13) requires far more than acquiring knowledge. It is not even enough for us to be convinced of the gospel; we must act and think so that we are converted by it. In contrast to the institutions of the world, which teach us to know something, the plan of salvation and the gospel of Jesus Christ challenge us to become something." 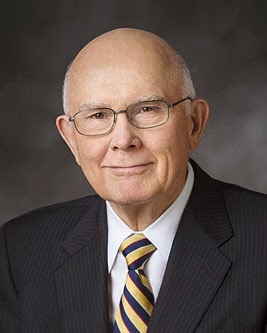 In his familiar style, always thorough and organized, Elder Oaks shared a message summarizing our understanding of the Godhead. After his careful explanation, this final section of his address provided somewhat of a "Therefore, what?" summary as he considers how that understanding can bless us in confronting our challenges. Having a correct understanding of the nature of God provides us with "the ultimate road map and assurance for our journey through mortality." The key is to make sure that understanding is correct; then we will also comprehend our relationship to God and how we can be blessed and helped in all of our needs. I truly love that summary. It doesn't matter at all what we know unless that knowledge leads us to become something different and better. So the blessing of our learning and understanding must be accompanied by a softened heart and a willing spirit. Labels: God, Gospel, Holy Ghost, Jesus Christ, Oaks Dallin H.